Tuesdays are dedicated to Single Living Skills so please send in your handy household tips, recipes, directions for plunging the toilet and all the other "fun" stuff you get to do now. They can be serious and of actual help, or you can vent a little. 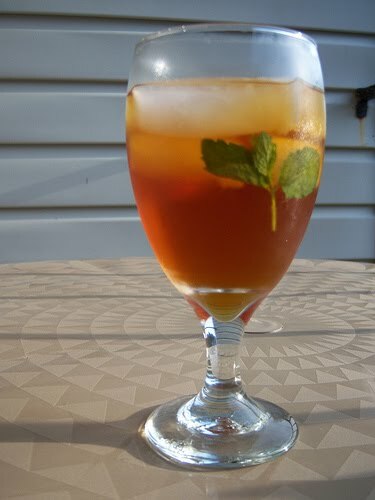 It just wouldn't be summer at my house without this special drink. The Single Living Skill to develop with this recipe is enjoyment, or make that enjoymint! It's a delicious alternative to sugary soft drinks this 4th of July. Combine the cloves and cinnamon stick with 1 cup of water. Boil together for 3 minutes. Turn off heat, let steep for 10 minutes, then strain. 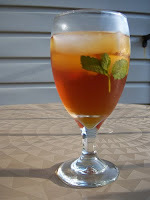 Put the strained infusion into your sun tea jar, fill with water, add tea bags. Add the minced mint leaves. Let it sit in the sun and brew several hours. Serve over ice. Add lemon slices or sugar to taste. Sit down, put your feet up, and imagine your happy place!